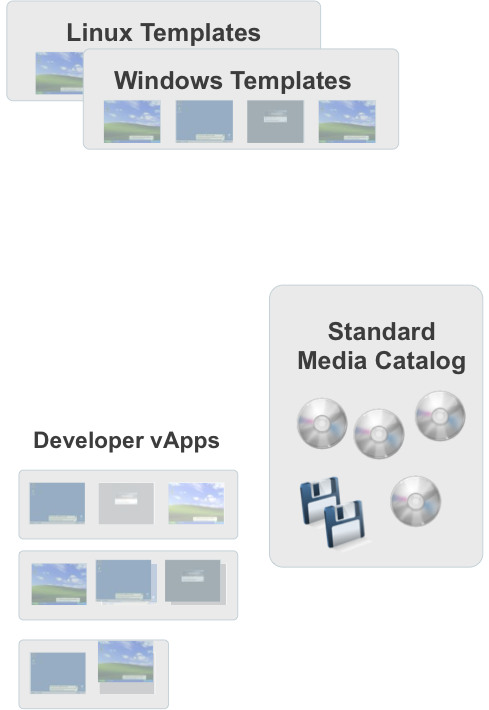 Catalogs are a collection of VM templates, vApps, and OS media that are available to organizations for deployment. There are typically two catalogs, the first catalog is the master catalog that is maintained by the cloud providers (IT infrastructure staff). Typically these consist of the server operating system (Windows and Linux) loaded with infrastructure monitoring and security tools. Templates could also include core infrastructure components like IIS and SQL. The intention of the master catalog is to provide templates to the users in an Organization, but they can't edit them. 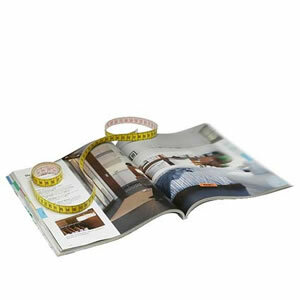 You are going to want to create a master organization for you master catalog. This organization should be set with PAYG (pay as you go) so it does not consume any resources from the cluster because they are never powered on. Organizations then make copies of these templates and customize them to meet their specific business unit needs. These modified templates become a part of the organization catalog. 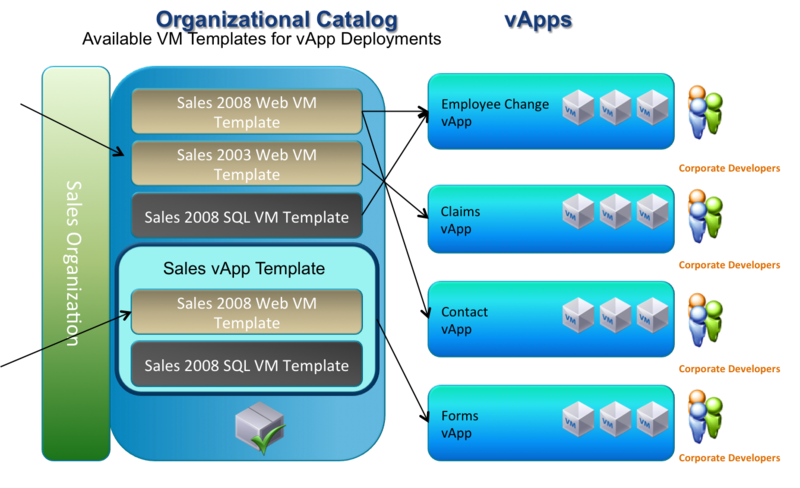 Below is an example of what the Organization Catalog may look like for the Sales organization. This catalog includes a Windows Server 2008 and 2003 Web VM, Windows Server 2008 SQL VM, and a vApp that includes a Windows Server 2008 Web VM and a Windows 2008 SQL VM. The Sales developers can select a template to deploy to an existing vApp or deploy a new vApp. This is another layer of multi-tenancy, users in an organization are restricted to the virtual datacenters, vApps, and catalogs that belong to their organization. Fast Provisioning with linked clones will provision new VMs from a template without replicating the entire image. It links the snap-shots so common elements are stored only once. 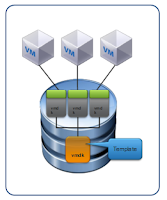 This dramatically speeds up provisioning time and reduces the storage footprint by over 60%. Sounds great right? There are lot of limitations with Fast Provisioning. The first is that if you are using VMFS you are limited to 8 host clusters just like VMware View. This problem doesn't exist if you are using NFS. 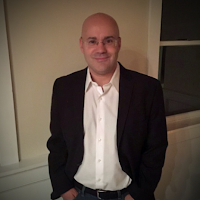 That is a considerable limitation for large corporations that are using scaled out clusters to take advantage of increased business continuity and cost reduction. The next problem is that if your snap-shot chain gets close to the 30 link limitation then you can see degraded performance. Furthermore, unlike VMware View you cannot make changes to the master file and have them update the chain. There is no composer feature with Fast Provisioning. It does make sense, if you were to recompose a server VM then you would remove all the changes on the server just like a VMware View client. That would be catastrophic in a server environment. Scenarios for Fast Provisioning are very limited, it would be a good solution for short-term test environments.